What’s in a name? For the third week in a row, creator Noah Hawley and his team turn to the world of philosophy for their episode title, cribbing this week’s from an essay by Albert Camus (following “Waiting for Dutch,” a reference to both Samuel Beckett and a group of people vocally anticipating the presidency of Ronald Reagan, in week one, and “Before the Law,” the name of a Kafka piece, in week two). With Kierkegaard next week and Ionesco down the road, it’s safe to say that Hawley & Co. are encouraging philosophical contemplation. Although given the fact that Camus’s The Myth of Sisyphus is about the absurdity of seeking meaning in a meaningless world, maybe they’re just playing with us. After a prologue in which Gerhardt enforcer Hanzee (Zahn MccLarnon) flashes back to a magician pulling a rabbit from a hat before snapping the neck of one in present day, we come upon a crucial meeting between the Gerhardt power structure and their underlings. As Floyd (Jean Smart) lays out the planned response to the threat of takeover by the Kansas City mafia, take careful notice of her sons’ body language. Bear (Angus Sampson) is hunched over, eating with his hands (again), vulnerable and comfortable. Dodd (Jeffrey Donovan) sits up straight, showing off his shoulder holster. He’s ready for war. But Floyd doesn’t want to battle yet — war will be a last resort. Like so many characters in the world of Fargo, the Gerhardts remain in a state of readiness for violence. To counter the Gerhardt Summit, Joe (Brad Garrett) and Mike (Bokeem Woodbine) plan their next move in a brief scene, confidently chitchatting about how even the water in this part of the country is soft, and agreeing that finding Rye will give them the leverage they need to move against the Gerhardts. Everyone’s looking for Rye. In many ways, these two early scenes are prologue for the meat of “The Myth of Sisyphus” — Lou’s (Patrick Wilson) journey into this increasingly dangerous territory (we see young Molly watching something called Operation: Eagle Nest while Dad is behind enemy lines to drive the point home further) known as Fargo, North Dakota. Lou is heading north to see if the judge shot dead at the Waffle Hut had any notable enemies when Hank lets him know that the fingerprint on the gun has been traced back to poor ground chuck Rye. In keeping with both Coen and Hawley iterations of this universe, Lou basically than stumbles into the heart of darkness when he runs into Ben Schmidt (Keir O’Donnell*), who informs him that meddling with the Gerhardt crime syndicate is a quick way to get killed. “The good news is World War I is over, the bad news is ‘Say hello to Adolf Hitler’” pretty much sums up the Fargo TV universe — every victory comes with a new defeat. Spotting the marvelously named and undeniably squirrelly Skip Spring, a.k.a. Mr. Watson (Mike Bradecich), looking skittish outside the judge’s office, Ben and Lou follow him down to his car, where a hilariously scripted scene takes place (with “They’re not just for women anymore, ya know?” harking back to The Hudsucker Proxy’s “You know, for kids!” for those keeping track of Coen-verse references). Despite his need to sell futuristic typewriters being the reason for most of this drama, Watson/Skip talks himself out of further investigation (although it’s a decision he may regret), and Ben and Lou let him go, heading off to a “Showdown at the Ya Know Corral” at the Gerhardt compound. After a crucial scene in which Bear tells his son that he wants him out of the dangerous business into which his family tree flung him, the law arrives on the Gerhardt lawn. In one of the best scenes in Fargo history, Lou informs the Gerhardts that they need to talk to Rye. Not revealing that they don’t know where he is either, things get tense on the Gerhardt front porch, especially after Dodd pops up to play a few alpha-male games with Officer Lou. When Lou reveals that Mike Milligan is probably looking for Rye, too, Floyd shows her only sign of concern. 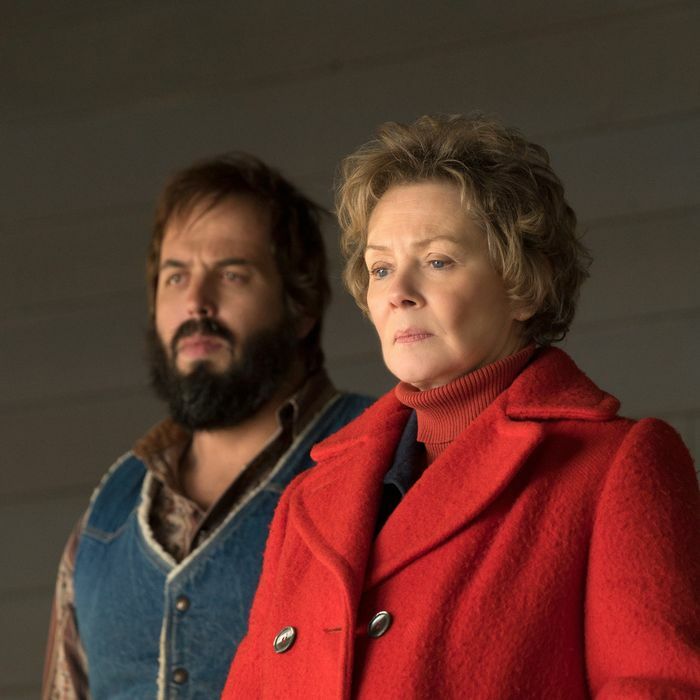 Jean Smart continues to be one of the best things about the second season of Fargo, capturing a woman who is most often the smartest person in the room without overplaying it. We hadn’t seen much of the Gerhardt syndicate before Otto’s stroke, but one gets the impression Floyd has been running things behind the scenes for longer than a few days. On his way out of town, and after Ben ditches him, Lou has another Fargo-esque chance encounter at Skip’s store, Carriage Typewriters, an old-fashioned name for an outlet about to start selling machines that “look like spaceships.” Solverson runs into “Mike Milligan and the Kitchen Brothers” (not a prog-rock band … yet) rooting through the back, and guns are drawn. Woodbine gets off a few good lines, but the scene feels designed to show us that Mike and Lou are remarkably cool under pressure. Mike is not like Dodd — someone who is going to puff out his chest to prove he’s a tough guy as the badass Gerhardt did just a few scenes earlier — and Lou is not like Ben, someone who shrinks from a threat. They are the real alpha males of the show. Meanwhile, Peggy (Kirsten Dunst) and Ed (Jesse Plemons) have some cleaning up to do. It begins with Peggy furiously sweeping up her salon as Betsy (Cristin Milioti) basically solves the case for her father. Just as Ed avoided being caught by Lou at his workplace in the previous episode, Peggy convinces Hank that the truth is implausible. However, it puts the fear into her, and she goes and gets Ed from work to handle a loose thread — the car with a Rye-size hole in the windshield. As she and Ed cross the street of Luverne, Minnesota, she in her hairstylist uniform and he in his butcher’s apron, it’s interesting to note how many of the characters of Fargo wear uniforms. Lou is almost always in one. Ed looks like a butcher even without the bloody apron. Even Skip’s outfit belies his salesman status. And don’t get me started on their ties. We could do a visual essay on “The Ties of Fargo and What They Say About Their Wearers,” from Mike’s casual bolo to Skip’s patriotic monstrosity to Lou’s no-nonsense necktie. After Peggy and Ed pinwheel their car into a tree (twice, as the first attempt results in a rear-end collision), they take the bus home, nearly looking comfortable in their belief that the worst is behind them. Of course, we know this can’t be true. It’s interesting that director Michael Uppendahl stages two crucial Peggy and Ed scenes displaced in time. We don’t see the second, pivotal crash — the one that will explain the broken window and that gives Ed whiplash — and we only hear them on the bus on their way home, a discussion that likely took place when they got home. It could be mere editing for space (they wanted the bus scene with the lost look on Ed’s face and the conversation), but it adds to the sense that things aren’t as right as these poor souls think. So, who is the Sisyphus of Fargo, pushing a boulder up a hill over and over again, to the point of futility? Is it Lou, and law enforcement in general, unable to stop what’s coming? Is it the pawns in the game like Rye and the typewriter kind of North Dakota, men crushed by the boulders of life? Or is it all of us, searching for meaning in a meaningless world? And yet we can’t stop looking. That awesome song at the beginning doesn’t just set the stage — it’s too coincidental to not be read as a reference. The song is “Yama Yama” by the Yamasuki Singers, who were really Daniel Vangarde and Jean Kluger. “Yamasuki” by the Yamasuki Singers was used over the closing credits of Kumiko, the Treasure Hunter, a film loosely inspired by a true story of a girl who became obsessed with Fargo and traveled to North Dakota looking for the buried loot in the film. See it if you haven’t. It’s clear that Lou doesn’t have time for fear. After a day in which he was threatened by a crime syndicate and had shotguns pointed at him, he comes home to his wife and father-in-law playing cribbage, and settles in like it was just another day on the job. I had heard some complaints that Wilson wasn’t getting enough screen time, but he really shines in this episode, grounding Lou in a way that makes us really believe he turns into the morally righteous rock that is the Keith Carradine version of Lou in season one. I want more Jean Smart. In a vast ensemble, she has done the most to stand out in her few scenes. I’d also settle for more Jesse Plemons and more Brad Garrett. Finally, thanks to Kenny Herzog for carving the path for these Fargo recaps, and passing the baton to me. I can’t wait to see where the road goes from here. * An earlier version of this piece referred to Keir O’Donnell as Keir Gilchrist.